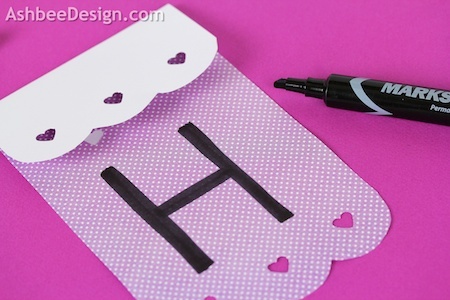 It is constructed of paper, simply folded, cut, punched, lettered and stapled onto a ribbon. It took me about 1/2 hour to create the entire thing and it looks great! First, it helps to have a supply closet. I can't imagine a DIY'er that doesn't. And I always keep a supply of interesting papers in my supply closet. 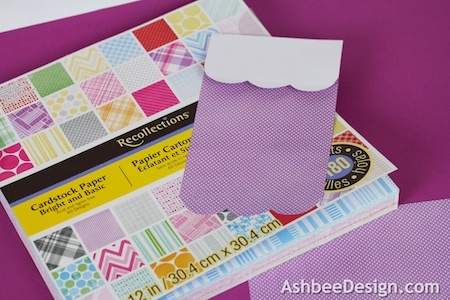 I have found the Recollections paper packets available at Michael's ( no disclosure necessary - my own opinion) to be a solution to many projects. I keep them on hand - and often use the online Michael's coupon to get a new one. For this project I picket out 5-6 different pink and purple pastel papers. I cut each into a 12" x 5" rectangle using a paper cutter. I then cut scallops along the top and bottom. This paper is fairly thin so I could cut the scallops in stacks of 6. I then folded over the top 3" to form the upper tab. I used my heart punch and punched a heart on every scallop - both along the top and bottom giving the edge a lacy appearance. 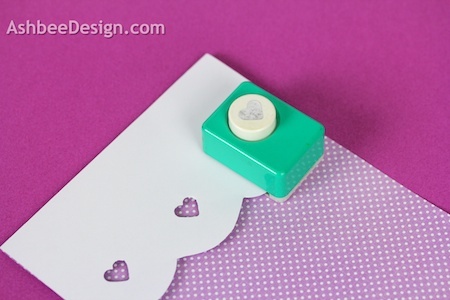 Other punches would work as well, even a snowflake design would look lacy. Using a fat black marker, I added some letters. I like freehand letters and when doing them for a light-hearted occasion, I like to add little balls to the ends of all letter strokes. It creates a fun font. I also keep a stash of satin ribbon (again often a bargain at the craft stores). 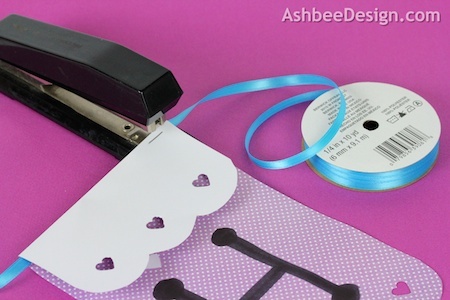 I chose one and stapled the individual letters with a flower for each onto the ribbon. Took a couple of thumb tacks and viola! 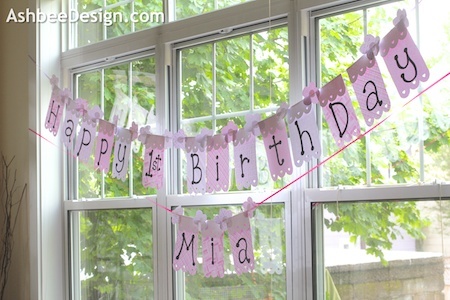 A Happy Birthday Banner for Mia! Awe! 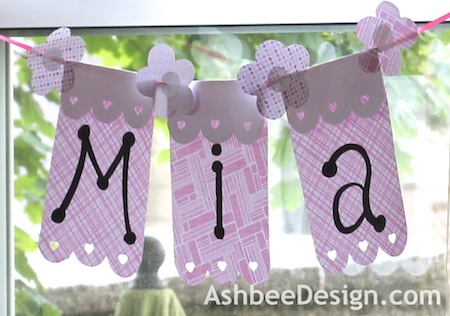 I always love a cute birthday banner! This is lovely! I would be so happy for you to link it up at Party In Polka Dots! It's going on now as I was late getting it up this week! Super CUTE! I love the soft pink. what a great idea using the punch. I will have to try this one for sure! Kel, Thanks! It was very easy and the result perfect for a little girl.